Are woodpeckers woodworkers or vandals with a beak? I need some input and perhaps some experienced feedback on designing plywood repair for my exterior home that has been damaged by flickers and other woodpeckers that are too common in my area. Complicating the repair is the elevation of the repair. The home is a split level with high elevations. Some of the offending holes are readily accessible, @10 feet. Others not so accommodating, @20 feet. Attached is a photo of the home showing damage to rafter tails and fascia from snow load damage. There are now 4 visible repairs to the exterior from the foul fowl in the shown area. A cordless cut out tool that I can use on a ladder with a uniform result is what I am after. There are 12-14 holes that I have repaired over the past years. The repairs are not attractive. I used cedar fencing material to cover the exterior hole awaiting ambition, time and a plan. So, the question is whether any of you have repaired exterior siding using a template and some cutout tool? Given the number of repairs needed, I think a uniform template with a cordless cutout tool for exterior plywood makes sense. I am thinking a template repair piece cut on my table saw or router with a collet for the inserts. I have repaired sheet rock where there is no access to support material for the repair. I have used a ledger board at the back of the repair, repaired and then taped/textured over the screws. Here I am thinking screws to attach the trim and screws and/or sealant for the repair piece. There are lots of cutout tools for sheetrock. RotoZip and others. With the number of repairs a uniform look is important. Makita has a vibrating cutout tool similar to flush trim tools. I guess a jig saw would work. Although tear out and following a template may be an issue. 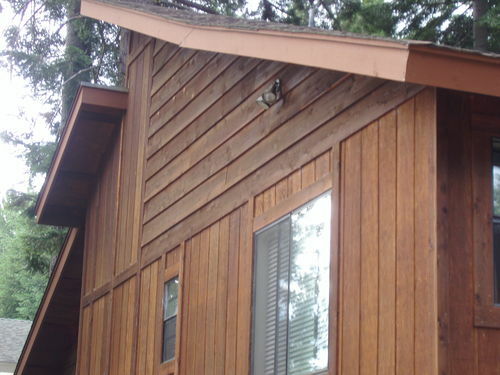 Then there is the issue of the replacement material matching stain to the 25 year old siding. I am trying to avoid a patchwork plywood appearance. Any ideas on stain, repair, design or anything else welcome. As said the last time I did this was before the advent of the cordless cutout tools. I had an old model of PC corded drywall tool. It had a chuck for 1/8 bits, and I could cut plywood and it’s glue, so going through cedar siding was like cheese, Thing is, allow the cutter to cut. I’ve snapped off a lot of 1/4” bits trying to force the cut. Most of the ones I did were from a Cherry picker, so I had full use of both hands once I got the bucket to where it needed to be. I would just hold the guide template, and route out the center. You could use a trim router for more beef,and an upgrade to 1/4” bits though if you felt you needed more. Have you thought of an oscillating tool? I’ve found them very useful for precise cutting with a very thin kerf for softer woods. I would think it would be much simpler than trying to use a roto-zip to make the cut. 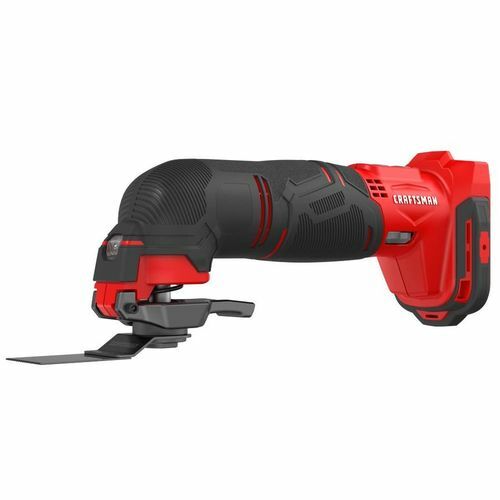 This one is $70 at lowes, though I’m not a fan of C-man or this type of battery tools, but the price for the specific job makes sense. you might try setting up a feeder specifically for the birds? Thanks for the input. I need a uniform template to cut the replacement piece and work on the ladder to place the template to cutout the damage. I like the idea to have small, medium and large templates to address the sizes of the various holes. Most are in the small-medium range. There are maybe two that will need special attention. Matching grain and stain will be a challenge. A bird feeder would just encourage the vandals. 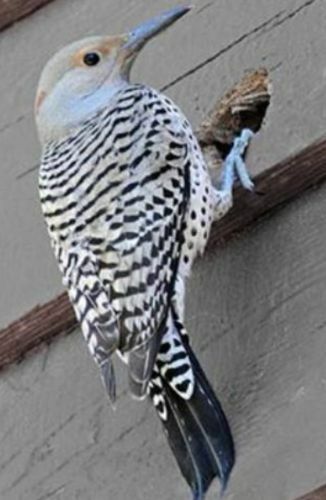 Flickers are tenacious and a well known irritant in the area. 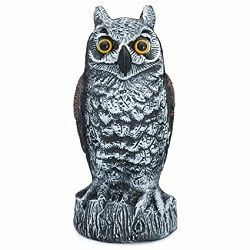 Driving the area and there are plastic owls and irritape all over. And, you can hear and see flickers going after homes.